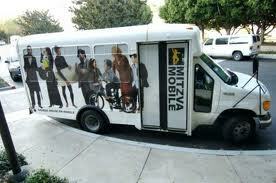 There are Chabad Mitzvah Mobiles, and there are Chabad Mitzvah Mobiles. You've probably seen them, sometimes called Mitzvah Tanks, cruising the streets of cities everywhere, stopping to find a Jew and helping him to put on tefilin, or to have a bite in a portable sukkah, or to light Chanukah candles. Last March we introduced you to Mendy Pellin, Chabad's chief comedian, humor commentator, and host of Chabad News Online. Two years ago, Pellin got a big surprise when a Mitzvah Mobile mission took him on an adventure in an unexpected direction. Planning to drive from Los Angeles to the northern tip of California and back, giving out menorahs along the way, he found a mysterious note attached to the windshield of his van. In this video, Mendy tells the story of how the note led him to modify his route and perform an unexpected mitzvah that made Chanukah an even more joyous festival for the writer of the note and for all who rode the van to its surprise destination. Be sure to watch for cameo appearances by Arnold Schwarzenegger, Jay Leno, and Jon Voight. Enjoy!